As the main driver for bioenergy is to enable society to transform to more sustainable fuel and energy production systems, it is important to safeguard that bioenergy deployment happens within certain sustainability constraints. There is currently a high number of initiatives, including binding regulations and several voluntary sustainability standards for biomass, bioenergy and/or biofuels. Within IEA Bioenergy studies were performed to monitor the actual implementation process of sustainability regulations and certification, evaluate how stakeholders are affected and envisage the anticipated impact on worldwide markets and trade. On the basis of these studies, recommendations were made on how sustainability requirements could actually support further bioenergy deployment. Markets would gain from more harmonization and cross-compliance. A common language is needed as ‘sustainability’ of biomass involves different policy arenas and legal settings. Policy pathways should be clear and predictable, and future revisions of sustainability requirements should be open and transparent. Sustainability assurance systems (both through binding regulations and voluntary certification) should take into account how markets work, in relation to different biomass applications (avoiding discrimination among end-uses and users). It should also take into account the way investment decisions are taken, administrative requirements for smallholders, and the position of developing countries. Dehue, B., Hamelinck, C., Reece, G., de Lint, S., Archer, R., & Garcia, E. (2008). Sustainability reporting within the RTFO: Framework report. Ecofys BV, Jan 2008. Available at: http://biomass.ucdavis.edu/secure/materials/sustainability%20committee/Ecofys%20sustainabilityreporting%20May07.pdf. Accessed Feb 2013. EC. (2009). Directive 2009/28/EC of the European Parliament and of the Council of 23 April 2009 on the promotion of the use of energy from renewable sources and amending and subsequently repealing Directives 2001/77/EC and 2003/30/EC. Apr 2009. Available at: http://eur-lex.europa.eu/LexUriServ/LexUriServ.do?uri=OJ:L:2009:140:0016:0062:EN:PDF. Accessed Feb 2013. EC. (2010). Report from the Commission to the council and the European Parliament on sustainability requirements for the use of solid and gaseous biomass sources in electricity, heating and cooling. COM(2010)11, Feb 2010. Available at: http://ec.europa.eu/energy/renewables/transparency_platform/doc/2010_report/com_2010_0011_3_report.pdf. Accessed Feb 2013. EC. (2012). Proposal for a Directive of the European Parliament and of the Council amending Directive 98/70/EC relating to the quality of petrol and diesel fuels and amending Directive 2009/28/EC on the promotion of the use of energy from renewable sources. COM(2012)595, Oct 2012. Available at: http://ec.europa.eu/clima/policies/transport/fuel/docs/com_2012_595_en.pdf. Accessed Feb 2013. Goh, C. S. et al. (2013). Impacts of sustainability certification on bioenergy markets and trade. Subreport (Task 3) of the study ‘Monitoring Sustainability Certification of Bioenergy’, joint study involving IEA Bioenergy Task 40, Task 43 and Task 38. 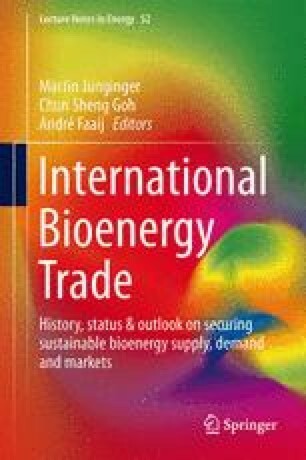 Available at: http://bioenergytrade.org/downloads/iea-sust-cert-task-3-final2013.pdf. Accessed Feb 2013. Goovaerts, L. et al. (2013). Examining sustainability certification of bioenergy. Subreport (Task 1) of the study ‘Monitoring Sustainability Certification of Bioenergy’, joint study involving IEA Bioenergy Task 40, Task 43 and Task 38. Available at: http://bioenergytrade.org/downloads/iea-sust-cert-task-1-final2013.pdf. Accessed Feb 2013. ISCC. (2012). Available at: http://www.iscc-system.org. Accessed 13 June 2012. IWPB. (2012). Initiatives wood pellet buyers. Available at: http://www.laborelec.be/ENG/initiative-wood-pellet-buyers-iwpb. Accessed Feb 2013. Lieback, J., & Kapsa, K. (2011, June 6–10). Sustainable biomass in the light of certification and assessment schemes. Presented at the 19th European Biomass Conference and Exhibition, Berlin. Available at: http://www.etaflorence.it/proceedings/?detail=6891. Accessed Feb 2013. NTA 8080. (2009). Dutch Technical Agreement, NTA 8080, Sustainability criteria for biomass for energy purposes. Available at: http://www.sustainable-biomass.org/publicaties/3938. Accessed Feb 2013. O’Connell, D., Braid, A., Raison, J., Handberg, K., Cowie, A., Rodriguez, L., & George, B. (2009). Sustainable production of bioenergy: A review of global bioenergy sustainability frameworks and assessment systems. Rural Industries Research and Development Corporation, Canberra. Available at: https://rirdc.infoservices.com.au/items/09-167. Accessed Feb 2013. Pelkmans, L., Devriendt, N., Goovaerts, L., & Schouwenberg, P. P. (2012). Implementation of sustainability requirements for biofuels and bioenergy and related issues for markets and trade. Study accomplished within IEA Bioenergy Task 40. Available at: http://bioenergytrade.org/downloads/t40_implsustcert_final-report_march-2012.pdf. Accessed Feb 2013. Pelkmans, L. et al. (2013). Recommendations for improvement of sustainability certified markets. Subreport (Task 4) of the study ‘Monitoring Sustainability Certification of Bioenergy’, joint study involving IEA Bioenergy Task 40, Task 43 and Task 38. Available at: http://bioenergytrade.org/downloads/iea-sust-cert-task-4-final2013.pdf. Accessed Feb 2013. Stupak, I. et al. (2013). Survey on governance and certification of sustainable biomass and bioenergy. Subreport (Task 2) of the study ‘Monitoring Sustainability Certification of Bioenergy’, joint study involving IEA Bioenergy Task 40, Task 43 and Task 38. Feb 2013. Available at: http://bioenergytrade.org/downloads/iea-sust-cert-task-2-final2013.pdf. Accessed Feb 2013.
van Dam, J., et al. (2010). Update: Initiatives in the field of biomass and bioenergy certification, Background document ‘From the global efforts on certification of bioenergy towards an integrated approach based on sustainable land use planning’. Available at http://www.bioenergytrade.org/downloads/overviewcertificationsystemsfinalapril2010.pdf. Accessed Feb 2013.
van Dam, J., Ugarte, S., & van Iersel, S. (2012). Selecting a biomass certification system – a benchmark on level of assurance, costs and benefits. Study carried out for NL Agency. Mar 2012. Available at: http://www.agentschapnl.nl/sites/default/files/bijlagen/Report_study_Selecting%20a%20Certification%20System%20March%202012.pdf. Accessed Feb 2013.